You are at:Home»Terminal Lance»‘Terminal Lance’ Tuesdays: Why’s First Sergeant so upset? 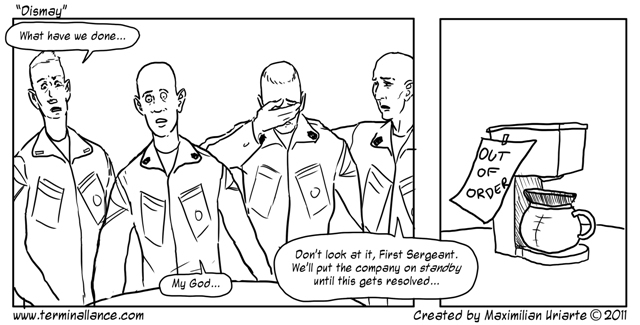 It’s Tuesday, so we’re opening the vault once more to bring you another exclusive “Terminal Lance” strip, published heretofore only in the pages of Marine Corps Times. “Dismay,” one of my all-time favorites, appeared in the issue dated Feb. 27, 2012. Seeing this, I imagine that First Sergeant’s a real close-talker — the sort of guy whose breath you have to smell every time he barks at you. And given his proclivity for java, as Max has depicted here, I’ve got to think First Sergeant’s breath has its own pulse. Ugh. 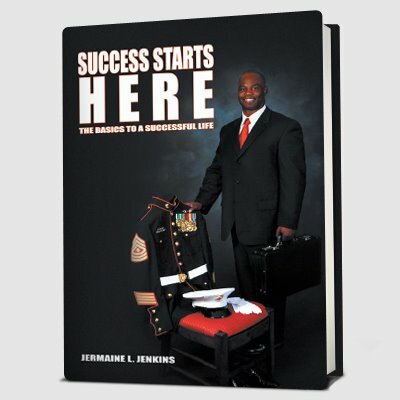 Got a good story about one of your first sergeants? Share it here. We’re all friends. You gotta think about it Dongiva, yeah they make abunch of money, but they probably have kids that are teenagers, so they don’t have as much as u think, my old first Sgt had 2 different cases of child support lol, so he wasn’t banking like we thought he was. I was the same way without coffee, or cigs, I went nuts. “Enforce the rules” Ya sure when there is a double standard for the SNCO’s and Officers when it comes to “rules” Get in a fight out in town? Oh wait SSgt your fine just no Meritorious Gunny board.. Oh hey Cpl you got in to a fight well sorry your now a Lance restricted to the brks for 60 days and we are going to take some pay as well. By the way the SSgt put a guy in the hospital for no reason while the Cpl tried to stop his friend from doing something stupid.. I would like to thank you for the efforts you have put in writing this web site. I am hoping the same high-grade web site post from you in the upcoming as well. Actually your creative writing abilities has inspired me to get my own web site now. Really the blogging is spreading its wings quickly. Your write up is a great example of it.